See the events calendar for current learning and volunteer opportunities. 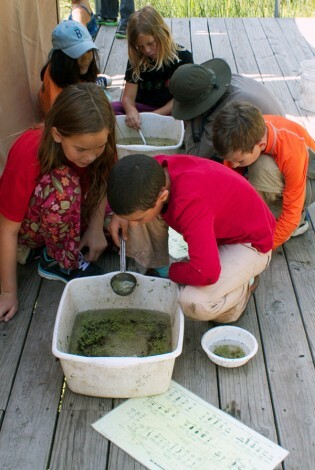 Pond dipping is a popular hands-on activity for learning about aquatic plant and insect life. The UW Arboretum is an exceptional place to learn about the natural world. Visitors, volunteers, families, naturalists, gardeners, land managers, educators, students, and scientists question, engage, discover, and build new understanding. Join weekly public walks guided by our professional naturalists, take a garden tour with our curators and other experts, or sign up for a class. Attend extended training to become a volunteer steward or ecological restoration team leader. Get involved with a citizen science project. We offer monthly family walks and programs designed especially for children to explore seasonal topics through learning and doing. In our summer Earth Focus Day Camp, children explore Arboretum trails and habitats through observation and engaging activities. Large groups can also request a naturalist-led private tour. We can tailor tours for school groups, scouts and youth groups, garden clubs, organizations, senior centers, and other group tours. Area naturalists deepen their understanding by attending Winter Enrichment lectures, which include recent research findings from UW researchers and other experts. At our Native Gardening Conference, beginning and experienced gardeners learn more about native plants and sustainable landscaping. Through our volunteer program, hundreds of community members contribute time and talent to the Arboretum while learning about ecological restoration, gardening, research, education, and more. We offer research and learning opportunities for university students and scientists. Faculty, graduate students, and undergraduates study Arboretum lands and advance restoration ecology through independent study, class projects, and research programs.